A saikei, or living landscape, planting combines living plants with materials such as rock, soil or sand to create the ambiance of a natural landscape. The saikei can vary as much as natural landscape does. It does not even have to be totally realistic. Although you can reconstruct a favorite view using materials from a particular habitat, your inspiration could be an exotic location, or even the realms of your imagination. Whatever type of saikei you plan, make sure that all of the components blend in with each other, and that the plants can all flourish in their environment. The possibilities of saikei planting are endless, bounded only by your ideas and expertise. Often, rocks add an air of drama to a design, with their cragginess and height enhancing the effect of distance and space. The frequently used Ibigawa rocks can suggest a landscape similar to that of their native Japan, or the rocky coasts of California and Maine. Low, smoother stones with horizontal strata lines will achieve a softer effect, perhaps recalling the outcrops of a moorland or heath. If you mold low banks of soil into the design, and cover them with grasses, mosses and low-growing ground cover, a more open, rolling landscape is simulated. You can create a coastal, riverside or lakeside view by using a container with a water reservoir, but skillful deployment of sand or grit will often achieve the same effect. 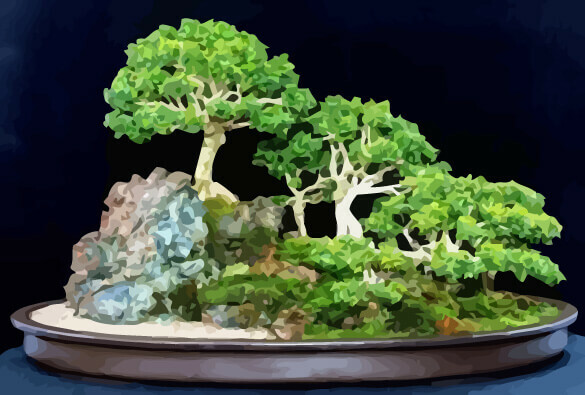 The living material can be seedlings or cuttings that you have propagated, plants from a garden center that you have shaped as you require, or trained bonsai. Place the large rock close to the front of the container, and the small rock nearer the back to create a sense of perspective. Make sure the rock strata all run the same way, as in nature. Seen in elevation , the highest point is one third away from the side of the container. The composition is an asymmetrical triangle, with one side more than twice as long as the other. Hold the plants in their pots against the rocks to choose the best positions for perspective. Position the trees first, then the low-growing plants and mosses. Place a shallow layer of gravel around the rocks. Pour potting soil between and behind the rocks. Support soil behind the rocks with smaller retaining stones. Plant trees in soil behind the large rock. Plant ground-cover plants in soil around the base of the trees, choosing those with the best height and texture. Trim heathers to resemble the trees, so that they will appear to be further away. Plant the heathers behind the secondary rock. Cover the soil with peat muck and press soaked moss gently into it. To retain the surface in steeply raked areas, push U-shaped wires through the moss into the soil.